Moving can be an exciting and stressful process all wrapped up into just a few short months! There is so much to do, and with what seems like so little time. Organizing your move can be much easier than you think – but it all starts with a plan. Before you get started you will want to have an organized checklist to asses what still needs to be completed before the big day. Need help with where to start? Allstate has a wonderful printable moving guide! Download it here. There is a lot to consider when making this list. 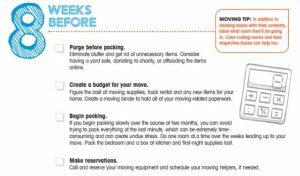 As you can see in the example above, keep in mind the purging of unwanted or unneeded items, transferring utility services, cleaning, hiring movers, packing and so on. Boxes can be purchased at your local hardware or shipping stores. On a tight budget? Ask around with friends and family or check with local stores for any boxes they would be happy to donate at no cost that they would either way be tossing. Boxes of all sizes will work but keep in mind that it is easier to stack boxes in a moving truck when they are are of the same size! This step will be crucial in making sure your move is as simple as possible. There are two steps to the labeling process. Step one: label by color. Step two: label by room. Like these pre-made moving labels? This step is quite simple, but also it is a fool proof way to keep your boxes organized and will help you to not lose anything important during your move! Congratulations, you have successfully made it into your new home! DONT FORGET ABOUT THAT CHECKLIST YOU MADE! Ensure you have all your items where they should be, and boxes made it into the right room. If you have hired movers, make sure they have not missed anything. You will want to unpack in order of urgency. Typically kitchen first, bathroom next, bedrooms and so on. You will want to have a meal shortly after you are settled in, and a bathroom break is inevitable! As you unpack you will decide on perfect placement and naturally get a “flow” and routine in your new home.